The Same Club - or an alternative? 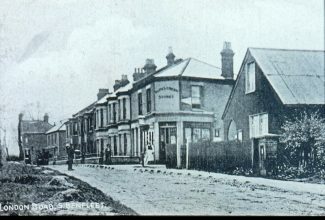 The building at the junction of High Road and Brook Road - could this have once been a cinema? 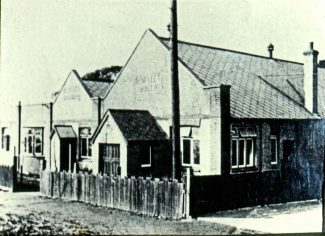 Changes on the site of what is now No.16 Brook Road – Hopes Green Care Home – can be found in photographs and documents over the years. 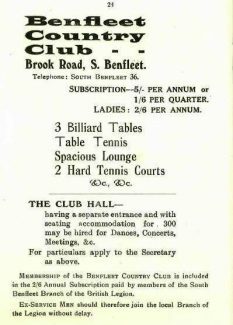 In the same document there is also an advertisement for ‘The Old Barn Club’, the address is 1 Brook Road and one wonders if this is the same club or if it could possibly be a similar club held in the building on the corner of Brook Road and High Road! It is rumoured that this was also used as a cinema but we have no definite information on that. 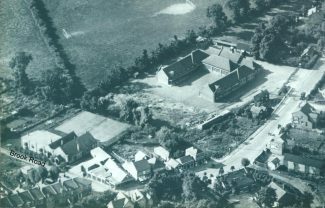 The aerial photograph, taken around the time the new school was built, shows clearly the position of the club and tennis courts. On the corner can be seen the premises which could possibly be another club. 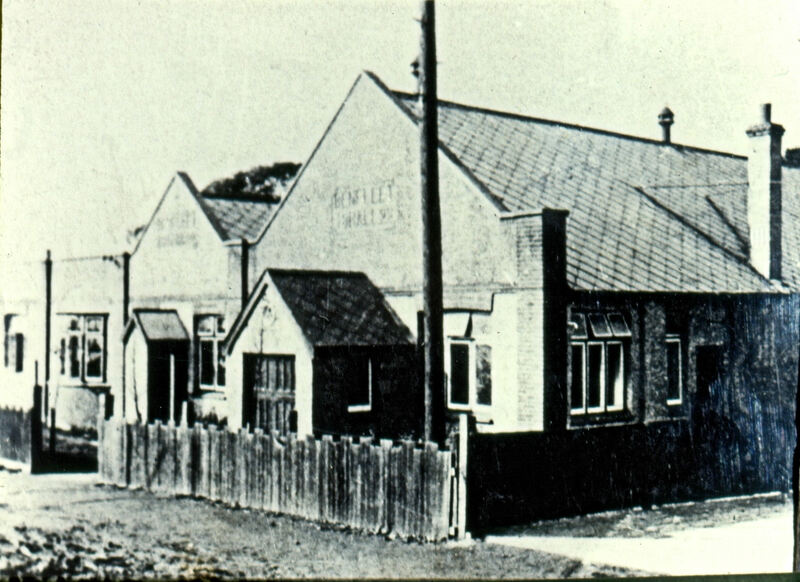 When this picture was taken that building was being used as a shop – possibly the forerunner to Pickets cycle shop. 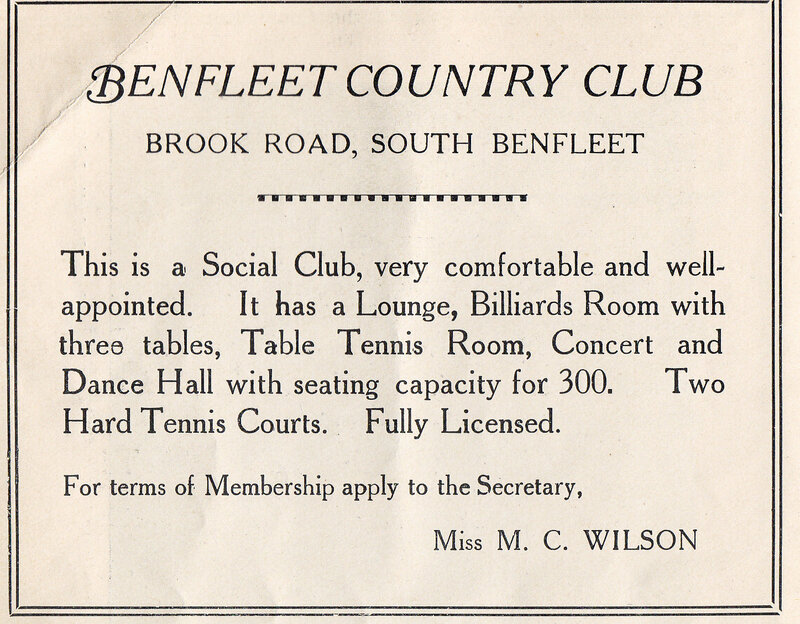 It is possible that the club finally closed around April 1943. 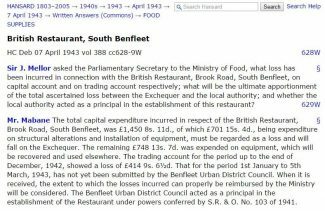 Certainly it would seem that the ‘British Restaurant, Brook Road, South Benfleet’ was in financial difficulty and was discussed in parliament. 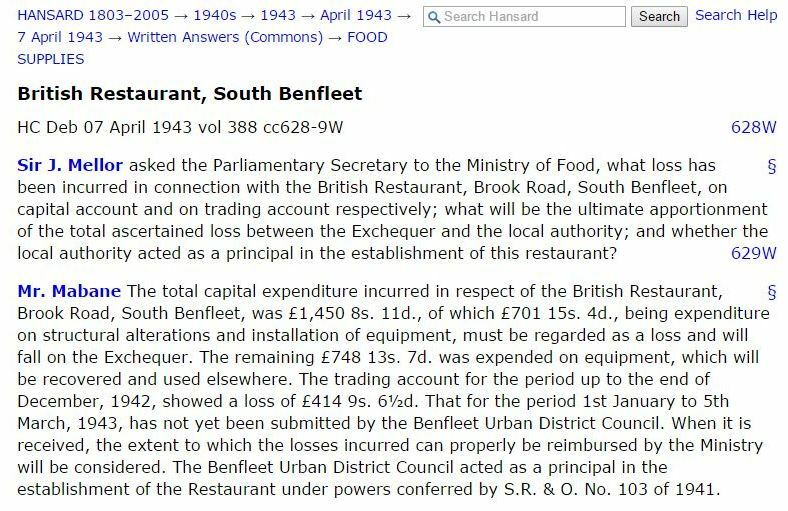 This is shown in the report in the official government publication ‘Hansard’. 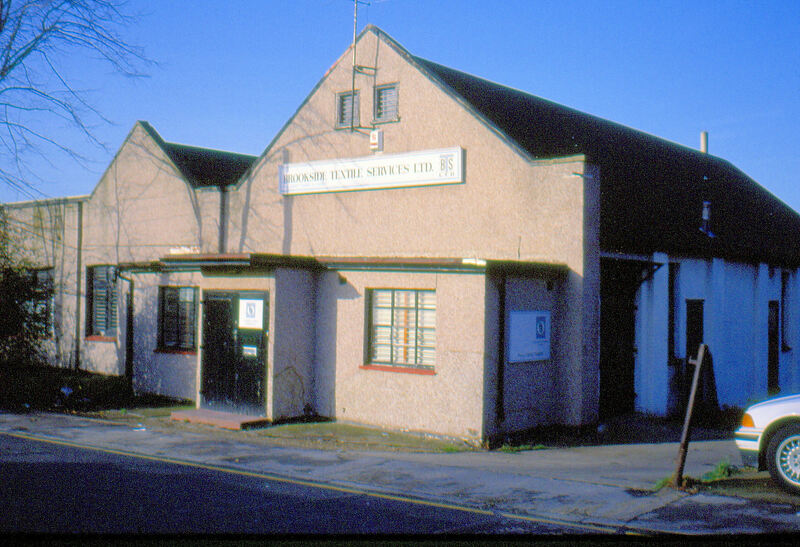 Upon the demise of the club the building was used as a factory, mainly in the manufacture of clothes. And so we come full circle, the old building was finally demolished in the late 1990s to make way for a new purpose built care home. 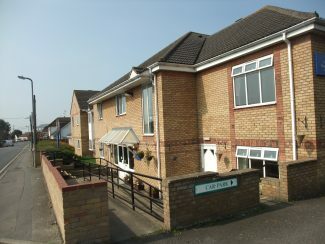 And so, Hopes Green Care Home began a new phase in the history of Brook Road! 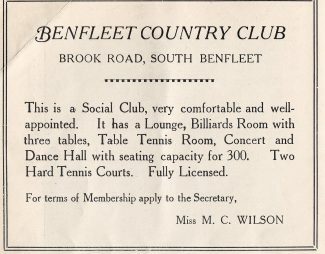 If you, or any family member, have any memories of the social club or of working in the factory we would be delighted to hear from you! I remember old Bill always got my sweets there or Franks at the dyke. My nan and my aunt always in the old barn club in the 60s Win and Nell. 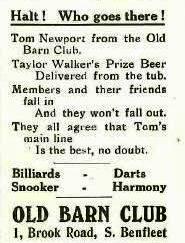 It was certainly the ‘Barn Club’ when I lived in 27, Brook Rd from 1956 to 1963. I only ever visited it once with my older brother John and his friend Pete Ewen. Mr Ewen, senior bought us 2d packets of peanuts. 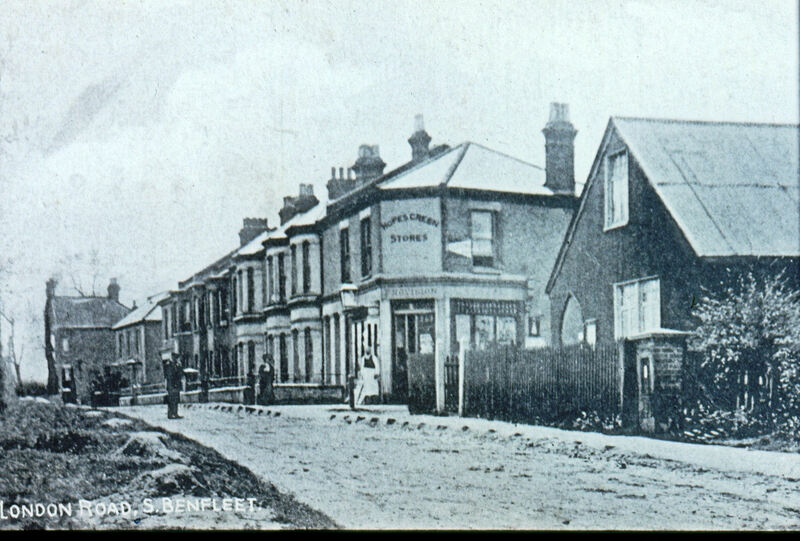 Turning left out of Brook Rd into the High Rd, we would walk past ‘Sharman’s general stores. The pavement outside was a massive display of household requisites. As kids we would walk into the shop to visit the shop dog, ‘Rex’. Further along before the ditch would be a small sweet-shop, unsurprisingly known to us as the ‘ditch shop’. Turning right out of Brook Rd would take us to ‘Bills’ sweet shop. I would be sent up here by my Dad to buy 10 Kensitas cigarettes, remember I was 6 or 7 years old at most. Bills was our sweet shop of choice and 2d or 3d would buy you a pocket full of sweets. 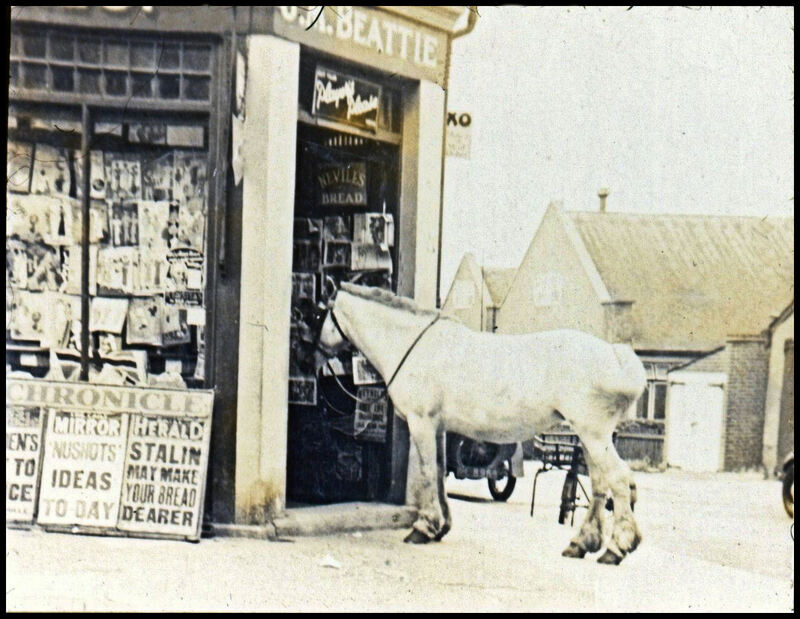 Nearby was ‘Eades’, a small grocers near the Co-op. In Eades were the tin boxes of biscuits with the perspex lids. Sufficient pestering of your Mum might lead to the purchase of half a pound of broken mixed biscuits. When I came to live in Benfleet in 1972 there was a Labour club on the corner of Brook Rd I am sure. It was taken down some time in 1980s I think.